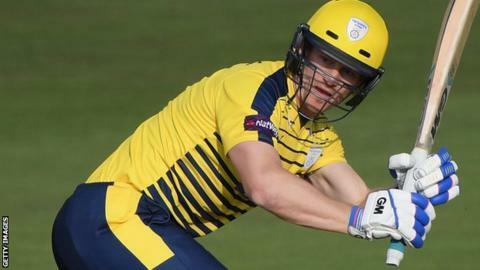 Hampshire managed to defend their score of 268-9 as they beat Sussex by nine runs in the One-Day Cup at Hove. Former Hampshire skipper Jimmy Adams anchored the innings before he was removed by England Lions teenager George Garton (3-40) for 92. Ryan McLaren added an unbeaten 46 to take the visitors to a par score. Sussex struggled until Chris Nash (69 not out) and Ben Brown (62) put on 125, but Brown's dismissal in the 47th over saw the hosts fall short on 259-6. Hampshire's bowlers kept things tight in the first half of Sussex's chase - managing to restrict them to 109-4 off 29 overs. But wicketkeeper Brown and Nash accelerated in the final stages of the innings reducing the target to 38 off the final four overs. However, Lewis McManus' superb diving catch behind the stumps to remove Brown off McLaren proved decisive as Nash was left with too much to do. Requiring 17 off the last over, Nash clubbed Brad Wheal's second ball to the boundary, but the teenage paceman restricted Sussex to just three more singles to secure victory.